So, you know how we’ve been raving on about Nobby Beach taking their foodie scene to a whole new level? Well, get ready for lift off. 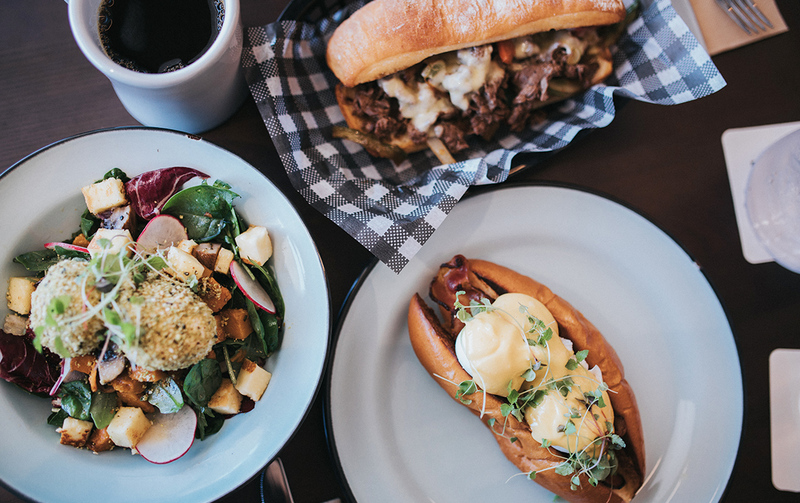 We’re pretty bloody lucky to have so many scrumptious eateries and grazing destinations here on the Gold Coast and the latest addition to the Nobby’s strip has, yet again, raised the bar nek level. Pinky’s Kitchen & Bar is the newest New York-inspired stomping ground smack bang on the corner of Lavarack Street and the main drag of Nobbys. 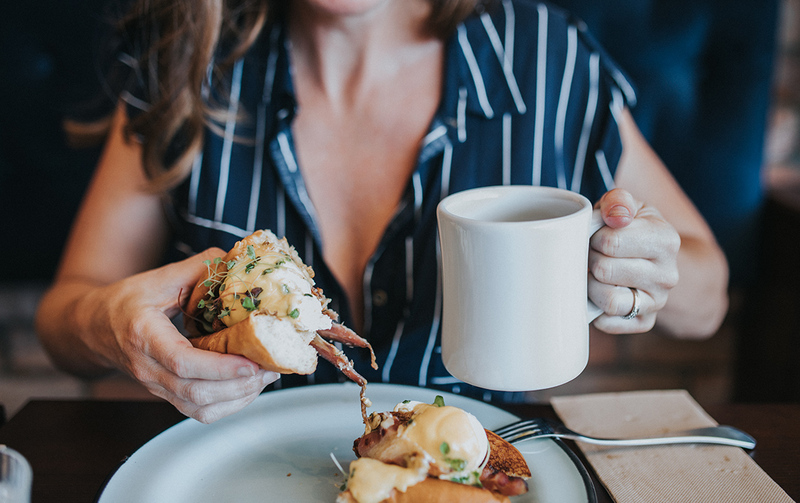 Head honcho, Brayden Condon, has completely transformed what was once a popular cafe destination into a rustic restaurant-meets-caffeine-slurping posi to enjoy delicious, indulgent meals and really good coffee. Brayden grew up working in his dad’s McDonalds stores and mastering all that goes on behind the scenes. You may then assume that his next ‘venture would take a similar fast food route to American-styled dishes. Think: burgers, chips and fizzy drinks in novelty glasses. Nuh-uh, you can expect waaay more from Pinky’s. You may also assume the layout mixes checkered tiles and girls on roller blades. Nope. Again, raise yo’ expectations. Pinky’s is unequivocally modern, edgy and exploding with effortless character. 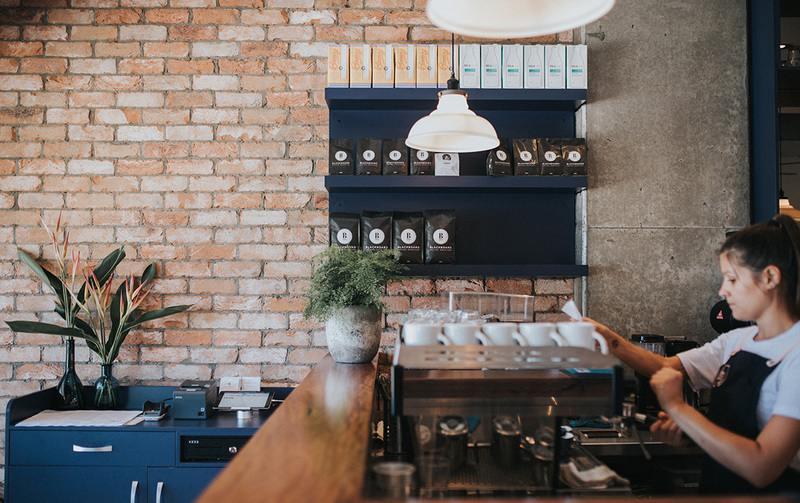 With its exposed brick feature wall, neon ‘serving it up’ sign and fully-stocked bar, you’ll catch these laid back cats serving your morning Blackboard coffees from 5am, pulling your lunchtime beers until 2pm and even fashioning up some traditional tasty filter coffee options. If the term ‘filter coffee’ leads you to visualise an episode of Seinfeld where this is essentially dirt in a mug, then you’ll be pleased to know the filter coffee at Pinky’s is anything but. They’re smooth, a little sweet and created using 60 grams of coffee, slowly dispersed over 10 minutes. All served in large (almost Simpson-esque) mugs. Huge believers in sourcing locally, all meats come from the Nobby Beach Butcher and the bar is filled with the likes of Balter, Byron Bay Brewery and Stone & Wood frothies. So, in the coming months, expect the crew to extend their hours into the night. And what’s on offer food-wise? Whip out your ‘I heart NY’ t-shirt and let’s get feasting. Take a glimpse at the menu and you’ll immediately be transported to downtown New York. Mixing traditional pastries, bagels and granola with one-of-a-kind eggs benny hot dogs topped with bacon or salmon and unique twists on your traditional potato rosti, Brayden has reinvented classic dishes and made them his own. A mix of signature sweet treats like the delish apple jaffle with caramelised apple, vanilla bean ice cream and added crunch; house made fresh cinnamon rollers and fluffy pancakes with emphasis on their cakey goodness, this place is not following the health-centric norm of others in the area. We mean, there are some freakin’ delicious salads with candied walnuts, apple, potato and heated grapes to make your health efforts way more fun. But you’ll totally come here for a full-flavoured experience and to gorge on sensational meals, no matter the calorie count. Your Mumma’s Kniches is a tasty party you won’t want to miss—inspired by an eastern European classic, this one stuffs pastry with smooth mashed potato, onion and meats. Mac ‘n’ cheese croquettes make an appearance too, and we’re nuts about deep fried carbs so we’ve already been won over. In saying this, don’t get too comfy. This menu is set to evolve and continue to spice up other American-inspired dishes for your benefit, with quality at the forefront of everything Pinky’s does. All day breakfasts, can’t-you-see-I’m-walkin’-here bagels, decadent sandwiches and mouth-watering burgers…Yep, it’s all here, baby. Stop by for a new hearty yet fresh casual dining experience at Pinky’s Kitchen & Bar. After all that calorie intake, you should probably go on a nature hike, yes?